We are all Icelanders now. Greece may be about to exit the Eurozone and default on its €323 billion national debt. A formal default and restoration of the drachma would certainly be an economy-shaking event — and now members of the ruling party in Greece, Syriza, are citing Iceland as a model to save their country. On April 9, 2011, the people of Iceland defeated a referendum that would have bailed out the UK and the Netherlands, which had covered the deposits of British and Dutch investors who had lost funds in Icesave bank in 2008. The UK and Netherlands demanded that Iceland repay them for the “loan” as a condition for admission into the European Union. Iceland refused. The final vote was 103,207 to 69,462, or 58.9 percent to 39.7 percent. A similar referendum in 2009 failed with 93.2 percent rejecting guaranteeing the deposits of foreign investors who had funds in the Icelandic bank. Afterward, Iceland undertook devaluation of its currency and guaranteed the deposits of its own citizens. A growing number of Syriza members propose a similar path. But without the drachma and its own independent central bank, Greece does not have these options. It is at the mercy of larger, wealthier Eurozone countries like Germany — which does not want to book any losses on the money it lent to Greece. Immediately, Greece owes €1.6 billion to the International Monetary due June 30 — and it cannot afford to pay, reports the Telegraph. Yet such a default might actually save Greece. 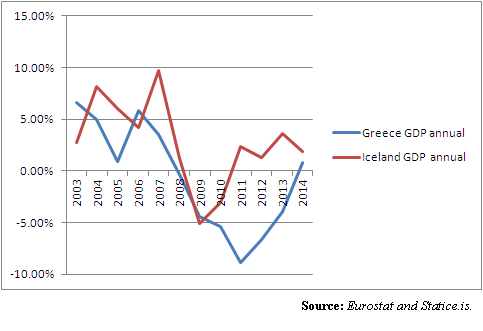 Just compare how the Greek and Icelandic economies have performed since the financial crisis of 2008. 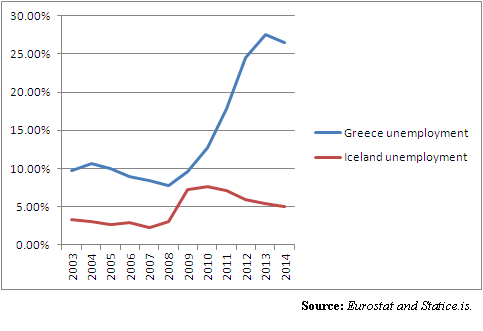 Both took hits, but Iceland has performed dramatically better after its default. Iceland’s unemployment peaked at 7.6 percent in 2010. Greece is still north of 25 percent today. Iceland’s recession ended after two years. Greece is still in the red with no end in sight, and with a debt that cannot possibly be repaid. How could things get any worse? Moreover, what have they got to lose? Default and a Euro exit could be Greece’s salvation.